Making loquat wine involves the tedious and mind-numbing task of removing the seeds from the fruit. Once that's complete, though, don't throw away the seeds. They can be used to make a delicious liqueur called nespolino, which is similar in flavor to amaretto. Loquat seeds, like the pits of other stone fruits (apricots, peaches, almonds, etc.) contain amygdalin, a cyanogenic glycoside. The body metabolizes this into hydrogen cyanide. Yes, for those of you who are rusty on your chemistry, that's the extremely poisonous compound commonly known as cyanide. There is a widespread misconception that amygdalin has anticarcinogenic properties. This has since been debunked as medical quackery. Please do not propagate this myth--do your research. That being said, the amount of amygdalin present in loquat seeds is relatively low and I'm not sure how much of it even makes its way into the liqueur. I've consumed a fair amount of this stuff in moderation and I obviously haven't died. I take no responsibility for your actions should you choose to ingest some nespolino yourself. First, leave the seeds out in the sun to dry for at least a week. They will begin to produce a fragrant almond-like smell before long. Once they have dried and feel lighter in weight, remove the thin, brown seed casings. You will end up with something that looks like roasted peanuts. I run some water over the seeds to remove any dust, then let them dry. Amygdalin is soluble in water so, again, this raises the question of whether the substance can leach out and into the liqueur. I'm no scientist--proceed at your own risk. Place the seeds in an airtight jar and fill it with grain alcohol. Some states prohibit the sale of overproof neutral spirits and, as a result, some people use the more readily-available vodka as a replacement. However, grain alcohol has no flavor aside from ethanol itself and is a better choice for a pure nespolino. Allow the infusion to steep for several months or until the liquid turns a dark brown. Give it a shake every once in a while. 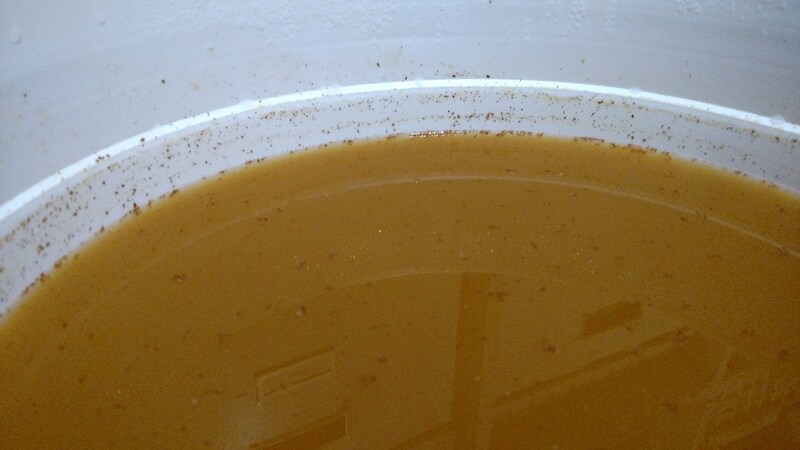 After six months or so, you'll have a nice, aromatic liquor. Pour it through a strainer and a coffee filter to remove the seeds and any rough sediment. It will taste like rocket fuel at this point, since it's still the same potency as it was when you started, so you'll need to mix it with some sugar syrup to make it palatable. Dissolve two parts sugar in one part boiling water and add the syrup to the liquor until you reach a balance you find agreeable. Allow the syrup to bond with the liquor for a few days. You may notice a cloudy haze developing near the top. I believe this is a result of oils from the seeds mixing with the sugar. I had to use bentonite to precipitate this matter so I could rack off it and even then it was difficult to do without stirring it up again. Fat washing (freezing the liqueur and scooping out the frozen lipids) doesn't work with this substance.